Walshe K, Rundall TG. Evidence-based management: from theory to practice in health care. Milbank Q. 2001;79(3):429- 457, iv-v. doi:10.1111/1468-0009.00214. Sharp D. Exploring evidence based management in the National Health Service. Nottingham Trent University; 2010. Rousseau DM. Is there Such a thing as “Evidence-Based Management”? Acad Manage Rev. 2006;31(2):256-269. doi:10.5465/AMR.2006.20208679. Soroush A, Mohseni M, Komasi S, Baharirad N, Moradi F. The Use of Evidence by Decision-Making Committees. Hosp Pract Res. 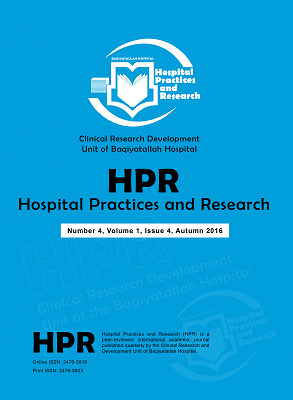 2017;2(4):128. doi:10.15171/hpr.2017.31. Greaves DE. Evidence-based management of Caribbean health systems: barriers and opportunities. Int J Health Gov. 2017;22(2):104-117. doi:10.1108/IJHG-01-2017-0001. Gautam K. Addressing the research-practice gap in healthcare management. J Public Health Manag Pract. 2008;14(2):155- 159. doi:10.1097/01.PHH.0000311894.57831.4b. Kovner AR, D’Aquila R, Fine DJ. Evidence-based management in healthcare. AUPHA: Health Administration Press; 2009. Shortell SM. Promoting evidence-based management. Front Health Serv Manage. 2006;22(3):23-29. doi:10.1097/01974520-200601000-00003.